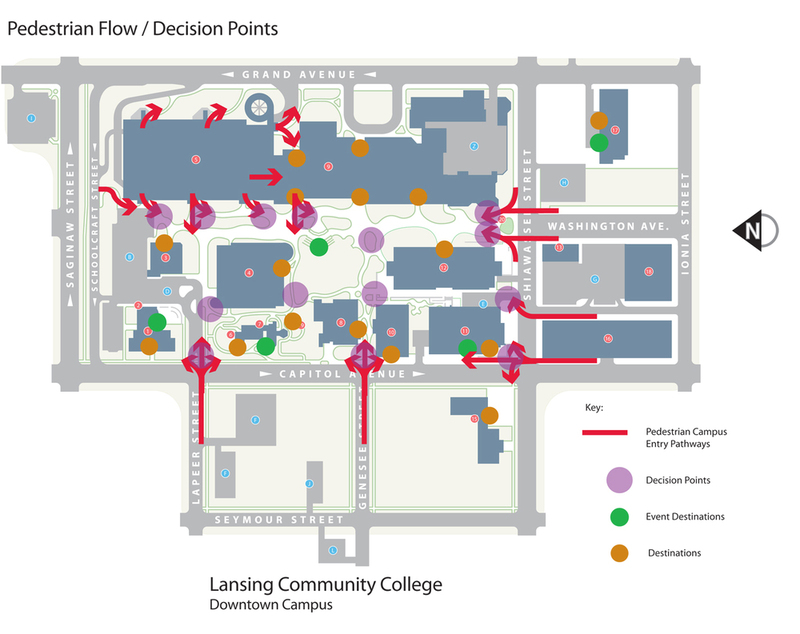 Case Study: Lansing Community College — Nicolson Associates, Inc.
Lansing Community College is a small urban college in a medium size city in the heart of Michigan. The 22,000 student body is primarily young commuters. The first few days of each semester are sheer panic for all the freshman, and everything we can do to help them find their way is going to help them cope. Many of the students come from small rural schools and are a bit overwhelmed with the new environment. The new students will learn the campus pretty quickly but an educational institution will have a constant stream of guest lecturers, parents, vendors and members of organizations renting meeting rooms. 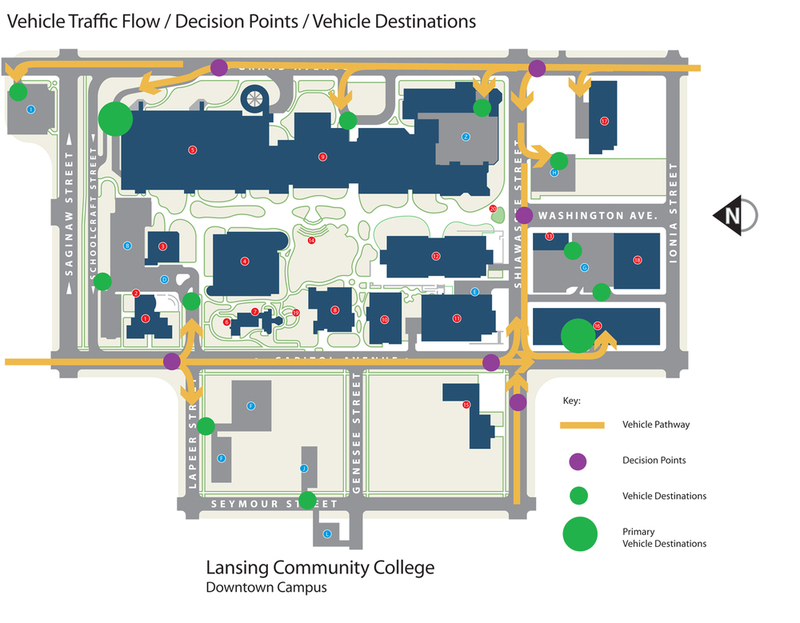 LCC is a downtown urban campus with multiple entry points made worse with many parking areas that need to be found by commuting students and visitors who then need to find the campus or their final destination. Like most urban campuses the boundary is almost invisible. Clear boundary identification was critical. One of the main parking garages is very large, has only one vehicle entrance, and each level matches directly to a corresponding level in an adjacent building. Wayfinding inside this parking garage was more complex than a typical garage because we needed to direct people to one of many possible pedestrian exits. We started with a series of interviews with many college stakeholders including those that interface with students and visitors and those that have operational concerns. We spent time speaking with students and observing traffic patterns around the campus and pedestrian movement on campus. We also performed an environmental analysis so we would understand the challenges we'll encounter with sign placement, lighting, and landscaping. One of our first steps was to create a vehicular traffic pattern study and a pedestrian flow study which then led directly to the creation of the sign location plan. See the documents below.